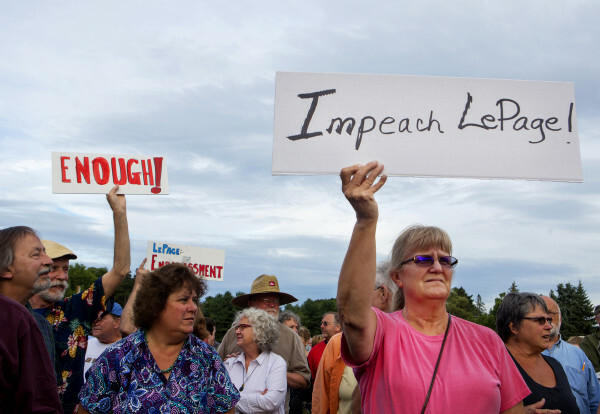 Members of the community hold up signs during a rally to show opposition to Gov. Paul LePage Tuesday in Capitol Park, across from the State House, in Augusta. Hundreds of people came out to listen to speakers and show support for LePage resigning from office. Karri Chohosey holds up a sign during a rally to show opposition to Gov. Paul LePage Tuesday in Capitol Park, across from the State House, in Augusta. Hundreds of people came out to listen to speakers and show support for LePage resigning from office. 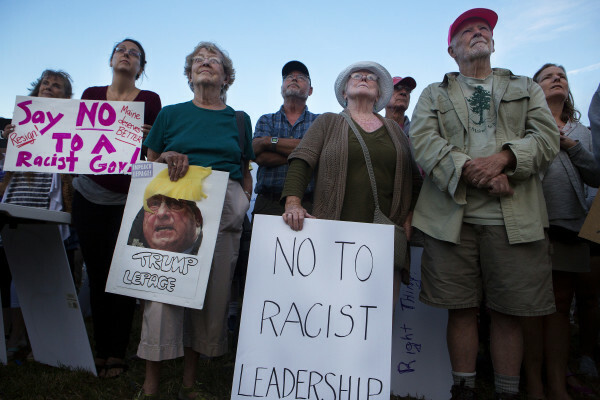 Members of the community listen to speakers during a rally to show opposition to Gov. Paul LePage Tuesday in Capitol Park, across from the State House, in Augusta. Hundreds of people came out to listen to speakers and show support for LePage resigning from office. Rachel Talbot-Ross, head of the Portland chapter of the NAACP, speaks during a rally to show opposition to Gov. Paul LePage Tuesday in Capitol Park, across from the State House, in Augusta. Hundreds of people came out to listen to speakers and show support for LePage resigning from office. 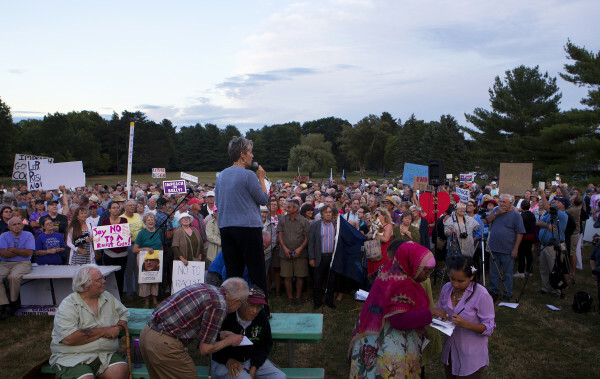 Hundreds of members of the community listen as Betsy Sweet (center) speaks during a rally to show opposition to Gov. Paul LePage Tuesday in Capitol Park, across from the State House, in Augusta. Hundreds of people came out to listen to speakers and show support for LePage resigning from office. 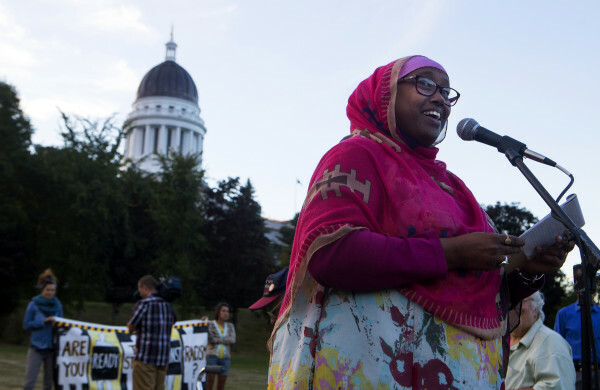 Deqa Dhalac, a member of Somali Community Center of Maine, speaks during a rally to show opposition to Gov. Paul LePage Tuesday in Capitol Park, across from the State House, in Augusta. Hundreds of people came out to listen to speakers and show support for LePage resigning from office. Hope Savage holds up a sign indicating Gov. 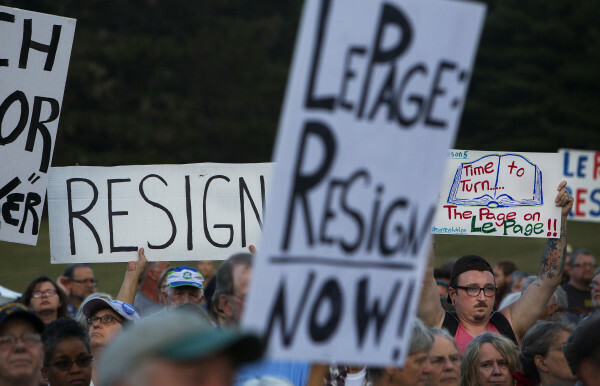 Paul LePage should resign during a rally to show opposition to LePage Tuesday in Capitol Park, across from the State House, in Augusta. Hundreds of people came out to listen to speakers and show support for LePage resigning from office. 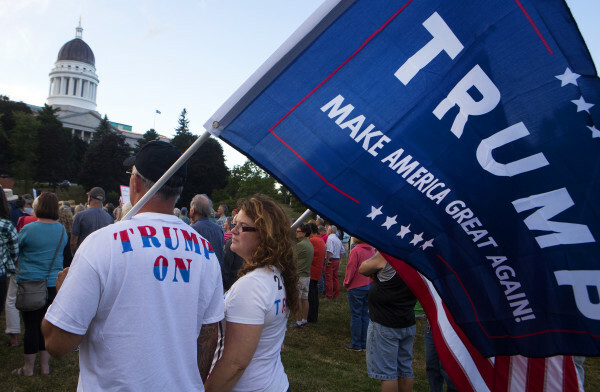 David Merrill (left) and Connie Smith wear pro-Donald Trump and Gov. Paul LePage shirts during a rally to show opposition to LePage Tuesday in Capitol Park, across from the State House, in Augusta. Hundreds of people came out to listen to speakers and show support for LePage resigning from office. A member of the community holds a sign during a rally to show opposition to Gov. Paul LePage Tuesday in Capitol Park, across from the State House, in Augusta. 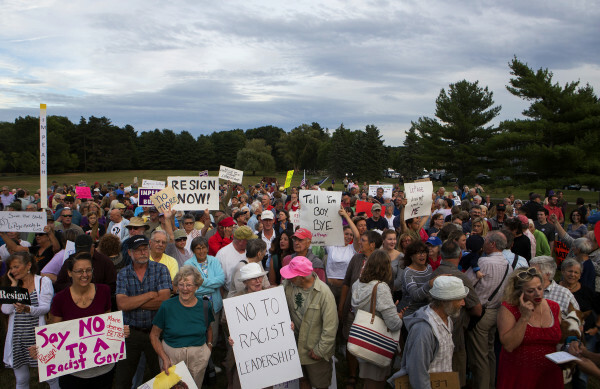 Hundreds of people came out to listen to speakers and show support for LePage resigning from office. 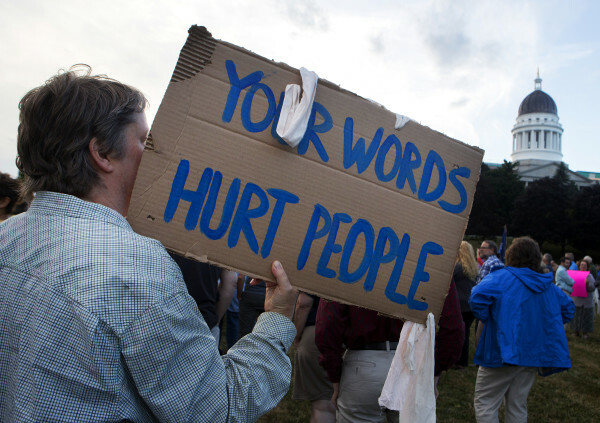 A member of the community wears a sign during a rally to show opposition to Gov. Paul LePage Tuesday in Capitol Park, across from the State House, in Augusta. Hundreds of people came out to listen to speakers and show support for LePage resigning from office. Members of the community gather together during a rally to show opposition to Gov. Paul LePage Tuesday in Capitol Park, across from the State House, in Augusta. Hundreds of people came out to listen to speakers and show support for LePage resigning from office. Robin St. Pierre (center) stands with other members of the community during a rally to show opposition to Gov. Paul LePage Tuesday in Capitol Park, across from the State House, in Augusta. Hundreds of people came out to listen to speakers and show support for LePage resigning from office. 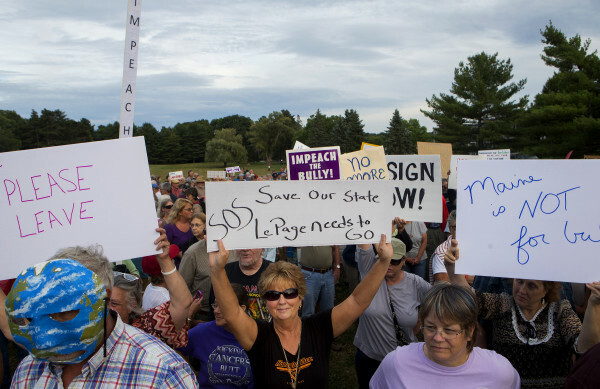 Mary Tracy (right) holds a sign that says "Impeach LePage" during a rally to show opposition to Gov. Paul LePage Tuesday in Capitol Park, across from the State House, in Augusta. Hundreds of people came out to listen to speakers and show support for LePage resigning from office. Scott Murray holds a sign above his head during a rally to show opposition to Gov. Paul LePage Tuesday in Capitol Park, across from the State House, in Augusta. Hundreds of people came out to listen to speakers and show support for LePage resigning from office. 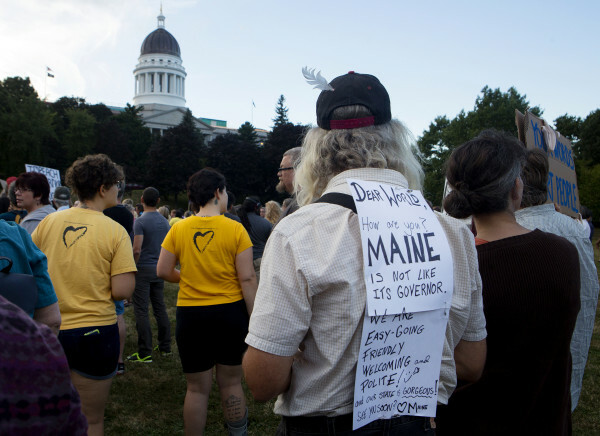 AUGUSTA, Maine — Several hundred people gathered Tuesday in a park across from the State House as part of an effort to send a message to Gov. Paul LePage: Stop bullying, support drug addiction treatment programs and if you can’t, step aside. 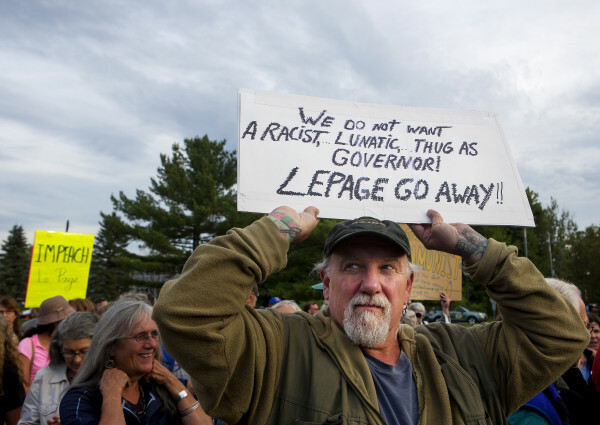 The rally was organized in response to a string of public statements by LePage that have attracted negative national attention. Betsy Sweet of Hallowell, who is a bullying prevention counselor and lobbyist, began organizing the event on Sunday. LePage, who is no stranger to making controversial and offensive statements, is under intense criticism for a series of comments he’s made since last week, ranging from his repeated contention that the vast majority of heroin dealers in Maine are black and Hispanic people from states to the south to leaving obscene insults on a Democratic representative’s voicemail. LePage has offered apologies for some of his remarks and has scheduled a meeting with the lawmaker he verbally attacked, Rep. Drew Gattine of Westbrook, on Wednesday morning. 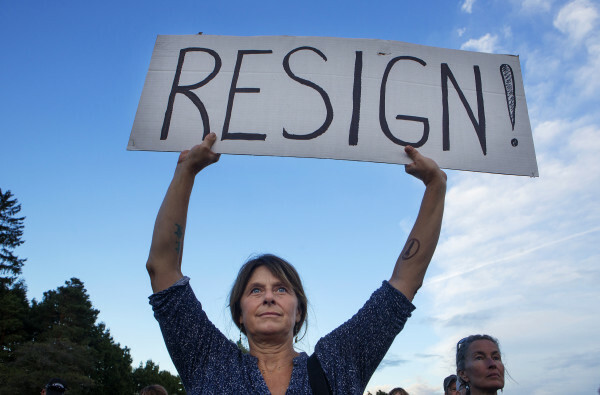 Meanwhile, lawmakers from both parties are considering how and whether to discipline the chief executive, who easily survived impeachment proceedings brought on by Democrats in January. Democrats have repeatedly called for LePage to resign, while House Republicans — who met Tuesday at the same time of the rally — voiced opposition to calling a special session on LePage’s behavior. Tuesday’s rally at Capitol Park started with a series of speeches and ended with attendees circling the perimeter and singing songs in the direction of the Blaine House, the governor’s residence. Many held signs and led chants. It was evident that there were very few LePage supporters present. Deqa Dhalac of South Portland, who is a member of the Somali Community Center of Maine, said LePage’s words have the potential to erupt in violence against minorities. LePage said during a radio interview Tuesday morning that he is consulting with family, friends and Republicans about what to do next. He said all options are on the table, including resignation, though his staff said later in the day that resignation was unlikely. Aside from impeachment, the Maine Constitution gives the secretary of state the authority to begin the process of removing a governor from office when he or she “is unable to discharge the duties of that office.” That process involves a hearing before the Maine Supreme Judicial Court, followed by a majority ruling. Secretary of State Matthew Dunlap said through a spokeswoman Tuesday that he is not commenting on the governor’s remarks nor the constitutional provision. 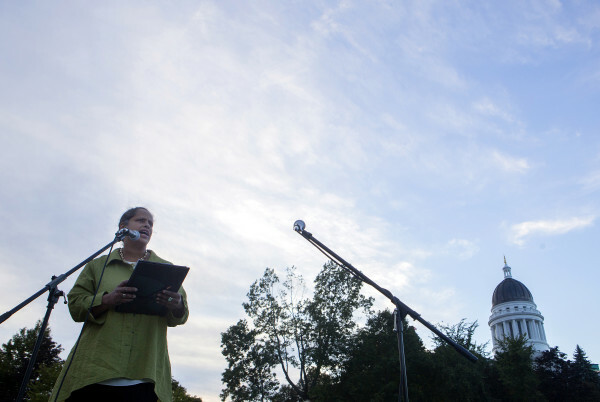 Another speaker at Tuesday’s rally was Rachel Talbot Ross, the longtime president of the NAACP of Portland. 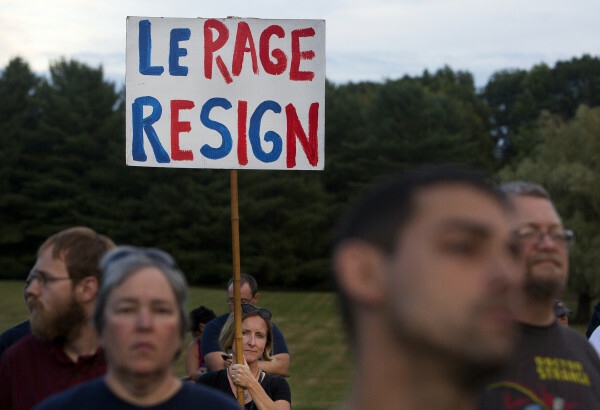 She touched on an emerging theme: That LePage’s outbursts are the result of an illness.